Esha Villas Umalas have a 4 bedroom villa with a private pool. We offer special bed & breakfast for couple & individual travelers a private rooms for rent daily/weekly at lower price in a minimum guests & enjoy our villa facilities. Located in the quiet village area of Umalas (meaning rice paddy and Forrest) and is about 20 minuets from Ngurah Rai International airport, 10 minutes drive to the batu belig seminyak beach where you can reach Mozaik Restaurant, Potato Head Club and Woo Bar at W hotel by walk along the beach. There is also a beach bar that you can enjoy sunset at the beach. Around the villa, you can walk to mini market, cafe's and smaller restaurants for lunch or dinner. Guests have access to all our Villa facilities such as Pool, Fully equipped kitchen, Living area, loung/sofa, dining area and parking. 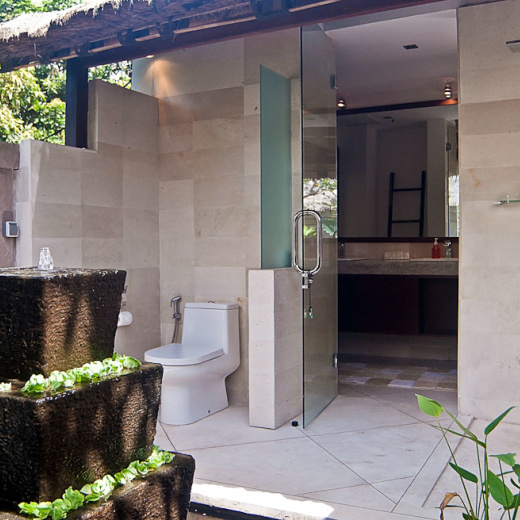 Guests will share this facilities with other travelers that stay in other private rooms in this Villa. Maximum travelers in our 4 bedrooms villa are 8 guests. - 1 large swimming pools with sunbeds expansive timber decks. - Large living spaces / sofa lounges/chilling areas both downstairs and upstairs. - 2 dining tables ( 8 chairs at Villa1 & 4 chairs at villa2) . - Water gardens with lotus and koi. - High-grade plumbing fixtures and an ultra modern, western-style kitchen with ice maker fridge, large 5 burner stove with wide oven, microwave, kettles, juice mixer, rice cooker and lots of cupboards adjoining the large dining area. - Lush & tropical landscaping and river front setting surrounded by many trees and bamboos plants at Villa2. - Water gardens and fountains throughout lots of natural light. - modern, high-thread count, white Egyptian cotton linens. Esha Villa Umalas is located in the quiet village area of Umalas (meaning rice paddy and forrest) and is about 20 minuets from Ngurah Rai International airport. 10 minutes drive to the batu belig seminyak beach where you can reach Mozaik Restaurant, Potato Head Club and Woo Bar at W hotel by walk along the beach. There is also a beach bar that you can enjoy sunset at the beach. not more than 10 minutes to explore most famous restaurants in Petitenget Seminyak area such as Metis restaurants, Sarong, Barbaqoa bar & restaurants and manymore of nightlife you can enjoy close by.